Mr Green first appeared in 2008, but it has quickly established itself as among the most competitive operators in the gambling industry. The Swedish operator accepts players from various countries across Europe. It’s also licensed Italy, UK and Malta. Mr Green won the Online Casino Operator of the Year for three consecutive years at the International Gaming Awards. MrGreen offers a large selection of games including jackpot games, slots, live casino tiles and traditional games such as roulette and blackjack. The number of games on the mobile version might be lower, but Mr Green adds new titles regularly. Traditional casino games have a classic look, while most slots titles have amazing graphics. Most games also feature free play, so you can play without creating an account or spending money. The site has helpful guides that can help novice players. The online casino chooses the best games from different reputable companies, including Bally Technologies, Quickspin, Net Entertainment, Betsoft and IGT. Since Mr Green is available in non-download mode, you can access it anytime without being limited to one computer when you want to play. Most of the slot games can now be played on your mobile phone thanks to the casino’s mobile offering. Mr Green may not be the largest online casino, but you won’t regret playing here because of its fairness, quality and dependability. The selection of game is so large that there’s always something for you to like. The average pay-out of over 97 per cent for all games combined also shows that there’s a good chance of winning. If you want to play slots, you can choose from 5 reel video slots and three reel slots. There are progressive slots such as Arabian Nights and Hall of Gods with jackpots paying millions or more. MrGreen also offers parlour and table games, so you will surely find your all-time favourites. There are various versions of roulette and blackjack to choose from. You can also play baccarat,; casino holds ‘em or blackjack with a live dealer. One of the best things about MrGreen is that it offers plenty of bonuses. New players are given a lavish welcome bonus upon their first deposit. They can use it on any of the slot machines offered by the casino. Just remember that Mr Green is a little strict when it comes to who can claim the bonus. Only few European countries are eligible. 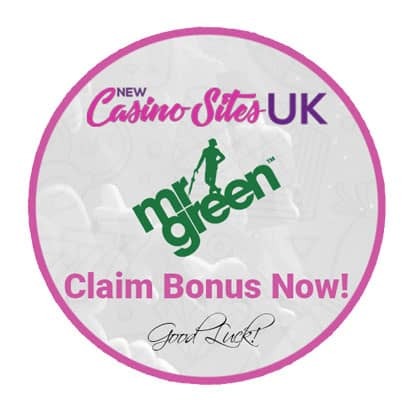 The casino has a rewards program called Mr Green Lift where you collet points by either logging in every day or playing. These points give you passes to weekly cash prize draws conducted every Thursday. MrGreen not only offers a large selection of games, but it is also committed to responsible gambling. Players can set green gambling limits that can’t be surpassed within a set time period. This prevents them from playing excessively. Mr Green is definitely one of the best online casinos that offer superior gaming entertainment to gambling enthusiasts.